Teksten en plaatjes op pakjes sigaretten (angstaanjagende voorlichting) werken niet (goed)! Op zoek naar dit artikel? Klik hier! This website collects a number of recent studies about the effectiveness of threatening communication. If you know of more articles on this topic, please contact me so I can add them. I'll add all articles that are Open Access (either through the Gold Road or the Green Road) and have adequate methodology given their research questions and conclusions. The statements below are each supported by one or more scientific articles - all articles are open access. You can click their titles, below each statement, to view the articles. The videocast accompanying the special issue on fear appeals from the International Journal of Psychology is here. In early 2018, a controversial paper was published that aimed to summarize the research on fear appeals as well as the history of this research. It sparked a lively debate, and seven commentaries were published. In the rejoinder to those commentaries, the original authors sought to identify common ground and move towards optimally effective behavior change interventions. 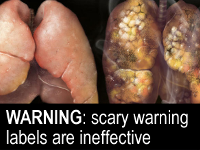 One example is the proposal to use the health communication space available on tobacco packaging, which is currently in use for warning labels that focus on threatening communication, for employing more powerful messages. Links to the papers in this debate are provided here. Pictorial cigarette pack warnings increase quitting: a comment on Kok et al. The extensive supplemental file for "Towards consensus on fear appeals"
Threatening communications (e.g. scary pictures) are usually ineffective and may even backfire. In fact, smokers pay more attention to coping information than to threatening information. However, people like fear appeals because of their intuitive appeal. Also, alternative methods for behavior change are not well known. This belief in fear appeal effectiveness is so strong that simply explaining why fear appeals are a bad idea may not work. Even professionals don't always adjust their convictions when explained why fear appeals are a bad idea. Our presentation on this project at EHPS 2012 in Prague. However, alternatives are readily available, and it is important to spread this knowledge.